Angel Invocation - Call the Angels. 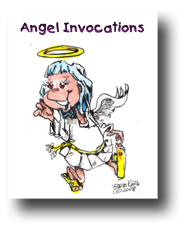 Angel Invocation have been used by thousands of people for centuries as spiritual tools. Invoking an Angel or Archangel is simply an appeal to or a calling on a higher power for assistance, blessing, help, inspiration, support or the like. And a ritual is any customary observance or practice and can take many forms, it may consist of simple routines which an individual submits to on a daily basis or it may be of a more complex ceremony. Start facing the East to invoke Archangel Uriel and as if in prayer say," I invoke Uriel in the space in front of me. Please give me clarity in this day. How can I best be of service." OR you can ask for help and clarity on a specific problem. Move then to your right, you are now facing South to invoke Archangel Raphael and again as if in prayer say, "I invoke Raphael in the space in behind me." Think about what's dying away in your life so that something new can be born, and ask Raphael for illumination or help with it and if there is a particular healing you need - physical, mental, emotional or spiritual - ask him for that. Turning right to the west, invoke the Archangel Gabriel who gives you strength to face and overcome your fears. Again as if in prayer say, "I invoke Gabriel to stand on my right." Ask, "What are my fears and where do I need strength." Then ask for his help. Turning right again, now facing North, invoke Archangel Michael. He is the energy of wisdom and love. Again as if in prayer say, "I invoke Michael to stand on my left." Spend a moment reflecting on your life and if there's something you feel you need insight on or true wisdom about, then ask for Michael's help. After the angel invocation of the Archangels, imagine the compassionate, feminine, nurturing and safe womb-like aspect of Source, God, "The All That Is". Visualize it washing over you and pouring through you expanding to surround and enclose you in an egg of light and love. Feel all negativity and doubt wash away as your heart becomes lighter and lighter. Linger in this Divine Presence for a while. Personally working with the Archangels is one of my favorite things, I find their help and support in all my healing sessions such a great help and inspiration, I always have my "Angel Cards" with me which I find to be a great inspiration. I also teach a course on healing with the Archangels which is such an amazing tool to have as part of your healing practice, you can see here that the curriculum is quite intense and will leave you with the ability to call on the Archangels for healing as well as know the best techniques for invoking their unique powers. Brilliant Seraphim I call to thee - circle 'round, bring love to me. Mighty Cherubim guard my gate - remove from me sorrow and hate. Thrones stand firm, stable be - keep me steady on land or sea. I call Dominions, leadership true - may I be fair in all I do. Circles of protection Powers form - help me weather any storm. Miraculous Virtues hover near - elemental energies I summon here. Principalities bring global reform - bless the world and each babe born. Glorious Archangels show me the way - to bring peace and harmony every day. Guardian angel, with all your might - bless me with your guiding light. Eee - "All that I am that is not physical, my mind	and my emotions. Nu - My physical body. Rah - My soul. Zay - In the company of Angels. The WHOLE CHANT means - I bring all of myself, mind, emotions, body and soul, together in the company of Angels. This angel invocation is from the book "Ask Your Angels". Sit down and relax allow your heart to open to the Angels. Close your eyes and open your mouth allowing the words to flow. Each word is chanted on the same note - C-sharp - but you can use whatever feels right for you and repeat as many times as needed.